How Important Is Masking Tape When Painting Your Home? Painting your own home can be both a fun and taxing experience at the same time. Depending on how experienced and prepared you are, you’ll either love it or hate it. If you’re looking for great results without having to pay a professional to do it, then make sure that you have all the necessary equipment and tools ready, and roll up your sleeves. One of the most common mistakes people make when painting, is not protecting their interior, such as the doors and floors. Consequently, they end up spraying paint all over them which certainly is a hassle to clean up afterwards. In order to prevent that, it’s best that you buy masking tape and apply it properly to prevent such situations. Once you buy masking tape, you can use it for a wide array of applications, such as labeling, in your car and even in your office. But before you apply masking tape anywhere in your home, there are several guidelines that you should follow to ensure everything goes smoothly. For starters, it’s important that you clean the surface where you’ll apply it, otherwise even the stickiest masking tape won’t stay on for as long as you need it. 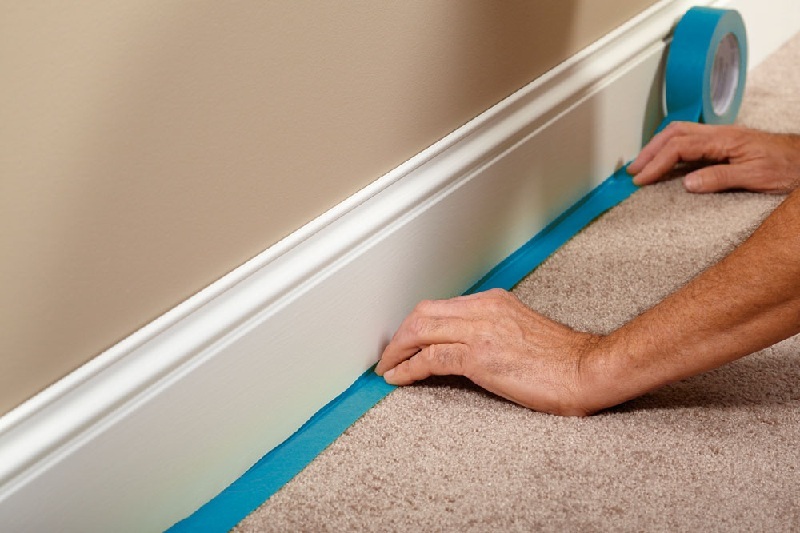 You’ll save yourself a lot of work, frustration and time down the road if you start by cleaning the wall or moldings where you plan on applying the tape. Next, you can use accessories such as a masking tape applicator. This not only simplifies the job, but it also makes it significantly quicker. You can buy applicators online or in home improvement and paint stores. All you need to do is simply roll it along the ceiling, wall or molding. You can then use the built-in cutter to cut the tape at the end of the run. This accessory can help even the most inexperienced person get amazing results. One of the trickiest places to apply masking tape are corners. However, you can use a simple technique to get it done properly. Start by running the tape up the wall, and make it a bit too long. Then press the tape down into the corner with a putty knife. Cut along the crease with a utility knife and remove the cutoff peace. Lastly, when the time comes to remove the tape, you’ll probably want to remove it right away, while the paint is still wet. However, that’s not very practical, even though water-based paint dries up very quickly. Instead, it’s best that you let the paint dry, then score the edge with a putty knife before pulling it off.